When Agriculture Commissioner Sid Miller granted amnesty to cupcakes on Monday, he pointed out that state rules that once banned such treats from classrooms were repealed last summer. But cupcakes have been allowed for a decade. 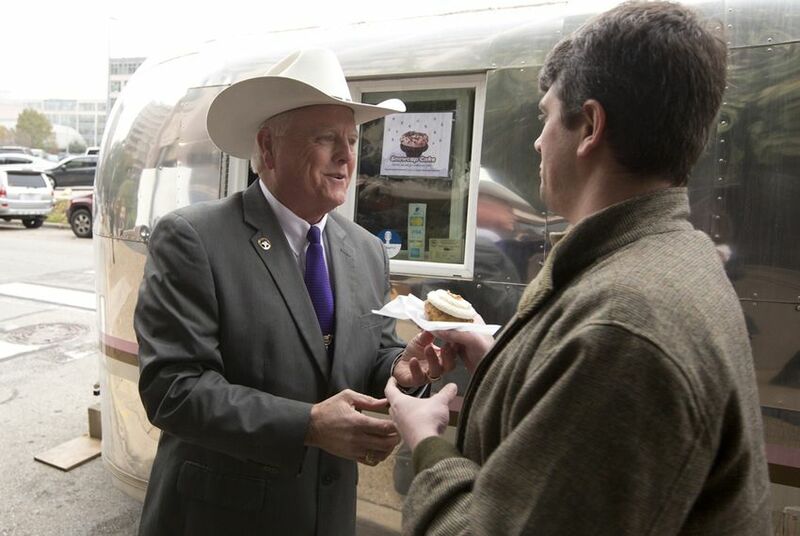 When newly elected Agriculture Commissioner Sid Miller announced on Monday that his first official act was to grant amnesty to cupcakes, he said he wanted to make sure Texans knew that state rules that once banned such treats from classrooms were repealed last summer. In August 2004, then-Agriculture Commissioner Susan Combs issued a clarification to a new statewide policy restricting junk food in schools. The "cupcake clarification" said that cakes and cupcakes could be brought to school for birthdays. In 2005, state lawmakers passed Lauren's Law, which guaranteed that right. “Kids have been able to have cupcakes in schools for years,” Combs, who was the state comptroller until earlier this month, said Wednesday. “To make light of the issue is to not be informed on the issue." Combs, a Republican who has pushed for policies that fight obesity, said she didn't understand the point of Miller's announcement, a press conference during which he emphasized his support of local control and took a bite of a cupcake. "I don't know what to expect from this administration," she said. "I can't imagine that cupcakes were a priority in a state with water or education problems like Texas has." Miller spokesman Bryan Black defended Monday's press conference. “Everywhere on the campaign trail, Miller heard people asking him about cupcakes,” Black said Wednesday. "That tells me it's still an issue." Last summer, when Todd Staples was commissioner, the agency repealed Combs' 2004 nutrition policy in order "to harmonize state rules with new federal rules," according to the repeal notice. The 2014 repeal did not change state policy on cupcakes, Combs said. On Monday at the press conference, Miller said he wanted “all Texans to be aware of this repeal." Passed in 2005, Lauren's Law was named after the then-13-year-old daughter of former Rep. Jim Dunnam, D-Waco. It allows parents to bring cupcakes – or other junk food – to classroom birthday parties and school events. The vote for Lauren's Law was unanimous, and among the 148 who voted in favor of it was Miller, then a state representative from Stephenville. “Unless they repealed that law and I never heard about it, it still stands,” said Dunnam, a Waco lawyer. Dunnam and Republican Rep. Dennis Bonnen, R-Angleton, attached the measure to an education bill as an amendment. Dunnam said the idea came from a conversation with his daughter. “The family was sitting around the kitchen, and I remember Lauren telling a story about some poor kid at school who was sent home after his parents brought pizza for their birthday,” Dunnam said Wednesday. A decade after the passage of Lauren's Law, cupcakes remain a sweet spot for Texas politicians. One person who doesn't mind all the fuss is Lauren Dunnam, who got married last year and is now known as Lauren Ratway. Even today, her dad said, she keeps a framed copy of Lauren's Law hanging on her wall.